Panoply’s AI machine learning algorithm which detects frequently run and long running queries, sub-queries or views. 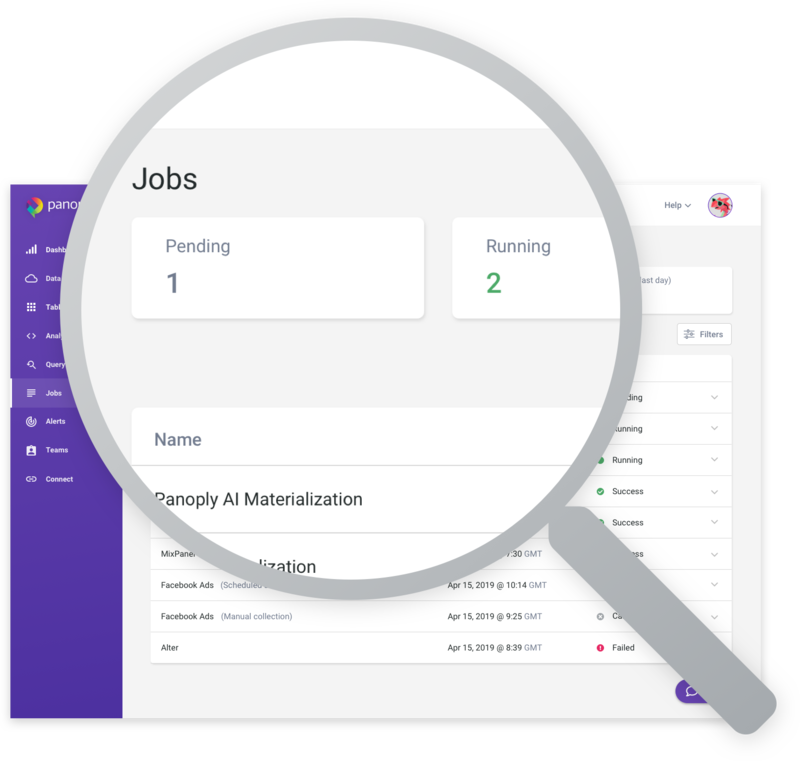 The AI automatically materializes the data to improve query performance. The AI also de-materializes the data if usage drops. A materialization manually created by a user to improve the speed of a query. The materialization generates a table with the cached results of the query. Data exported by a user as a .CSV file. The data is from a query run in the Analyze tool. A change to the metadata of any table or to any table column name. The change must be user initiated. A data source scheduled to automatically collect data at multiple intervals. A data source, manually run by a user, collecting data one time. All your jobs are neatly and simply categorized into four types: “Pending,” “Running,” “Successful” and “failed” within the last 24 hours. 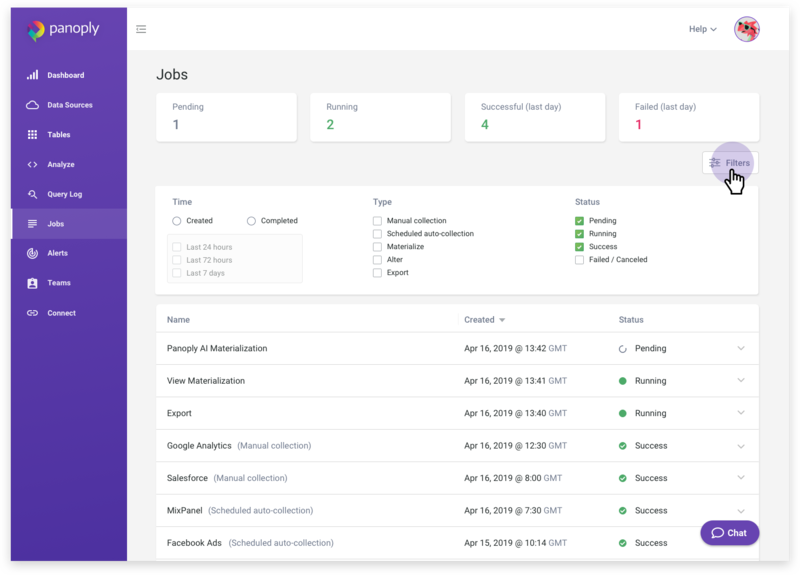 By checking your jobs you can ensure you have the latest performance status updates on the data ingested, files exported, and all your view and query materializations. For each type of job, you’ll see the status listed, in the “Jobs Found” pane underneath the “Filter” feature. 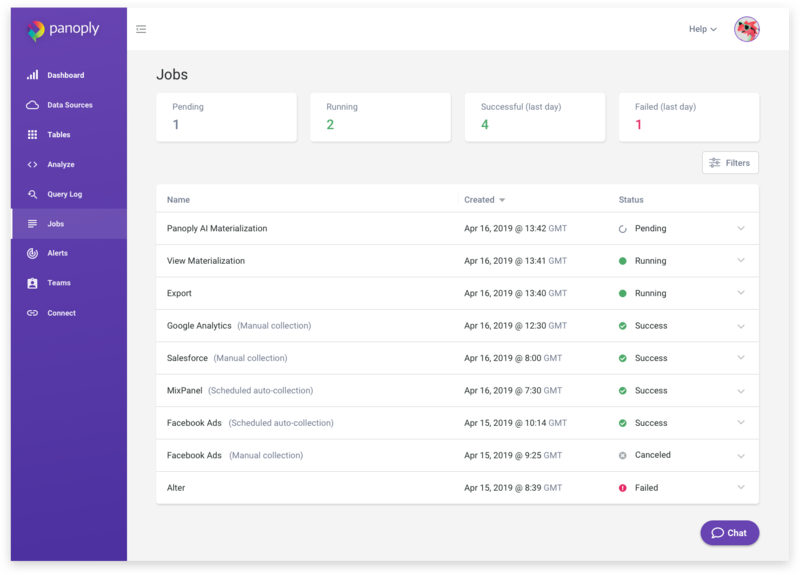 The Filter feature lets you search your jobs by parameters such as period of time from 24 hours to up to a week, type of job and current status. And You Thought Panoply Was Blazing Fast Already?? Wait Until You See Panoply's New Data Ingestion Engine!